The Japanese white pine is an evergreen conifer native to Japan. This beautiful specimen is recognized as one of the most beautiful of the Pine family. 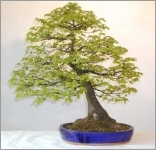 One of the classic bonsai trees and probably the most popular among bonsai collectors. 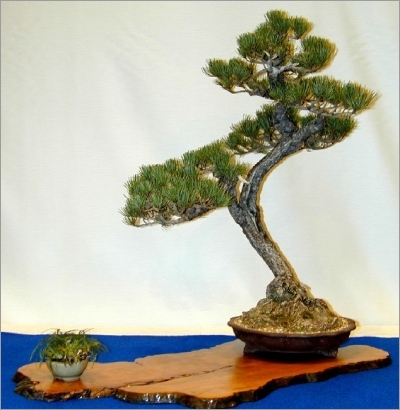 The Japanese White pine is suitable for most bonsai styles. If left to grow in the wild, it reaches 25 meters tall. Pyramidal with slender, short 1 to 2.5 inch long, blue-green needles; silvery underside. Needles are borne in clusters of 5. They are densely whorled, giving branches a tufted appearance. Wide spreading branches, dense in youth, becomes flat toped with age. The trunk is massive, straight, sometimes split into two or more stems. The young bark is smooth and gray, aging to a dull gray, rough, longitudinally fissured, peeling off into scales. Branchlets are gray-green to yellow-brown. The flowers are yellow. Flowers in May, with cones ripening in October of following year. The flowers are monoecious, individual flowers are either male or female, but both sexes can be found on the same plant, and are pollinated by Wind. The cones appear in clusters of 20-30, crowded on lower part of new shoots. They are cylindric, red-brown and green coloured when young, 5-6 mm long, 3 mm wide, with numerous stamens. The cones persist for many years.